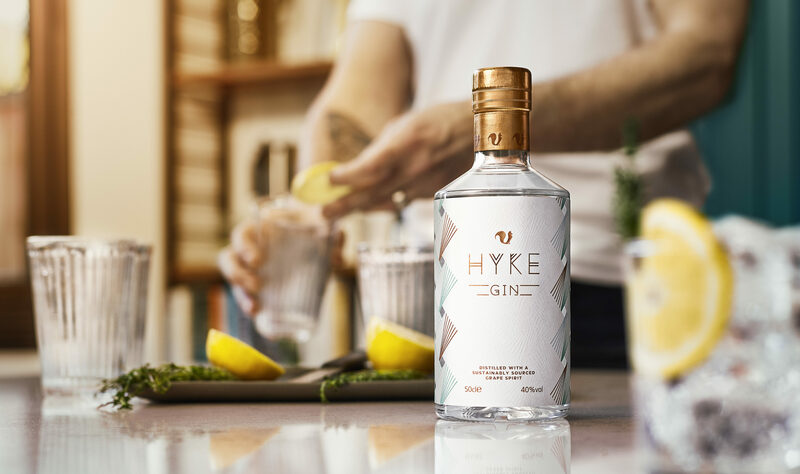 The impact of our work for HYKE Gin was highlighted in the exclusive distribution arrangement with Tesco, who committed to stocking the product in 300 of its UK stores, before even tasting the drink itself. Our relationship with Foxhole Spirits began in 2016 when we helped launch its eponymous gin – Foxhole Gin, which subsequently won a Silver IWSC Design award. Fast forward three years and the distiller continues to excel, and has now created a new premium and sustainably conscious gin – HYKE, which is made by using grape spirit produced from surplus fresh table grapes. HYKE Gin ingeniously re-invents the equivalent of 1.4 million punnets of internationally sourced grapes, per year, that are surplus to the requirements of the supply chain, into a luxury, handcrafted spirit. We were challenged to create a brand that was in-keeping with Foxhole’s ethos and stance on sustainability whilst at the same time, leaving a lasting impression on the consumer. The surplus grapes, having travelled from as far as Egypt and South Africa, were a source of inspiration for us when developing the brand identity from conception to completion. We wanted to capture the journey they had completed whilst also respecting their cultures. To that end, we introduced a geometric design to the label which was inspired by traditional Egyptian & African fabrics. The colour palette mimics oxidised copper, which together with the copper capsule is a nod to the traditional still that Foxhole Spirits use in its production process. With gin sales at a 50-year high, we knew we’d have to create something that would differentiate HYKE from the plethora of small-batch, on-trend gins in what’s already a crowded market. Therefore, we also created a world’s first; a design which features a combination of detailed aperture die cutting; foiling; embossing; and printing all together on the label. Every element of the bottle is made from recyclable material, with each detail of the process and materials considered, and the environmental impact reduced where possible. HYKE Gin is now available exclusively at Tesco superstores nationwide, priced £24 per 50cl bottle (40% ABV). To read more about our work for HYKE Gin, please click here to read our Journal article. "I firmly believe that we have a brand that not only looks absolutely incredible but is also going to stand out in the minds of consumers as something that looks and feels totally different to anything else on the shelf. The talent at Warren Creative have been the driving force behind this; their expertise, knowledge and total understanding of our brand and vision is the reason this has all come together in such a beautiful package."